If subscriber wishes to stop facebook packs they can SMS “FBOFF” to 5000. 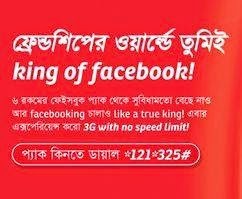 Along with facebook pack it is possible to activate and use other available airtel internet packs simultaneously. If facebook pack volume is consumed before the pack validity expiry, facebook browsing will be from other internet pack (if subscriber has other internet pack)or at PG2 (10KB/paisa) till validity expires. Pack reactivation within validity or auto renewal will carry forward the remaining volume. Great news for all facebook users! Your favorite facebook pack has gotten even better. 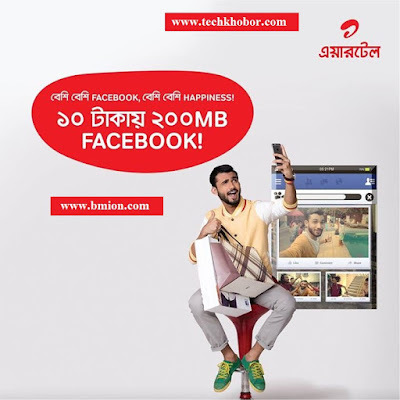 Now get 50MB facebook @5tk only and 120MB facebook for 10tk only!